James Wade and Robert Thornton sealed impressive victories on night eight of the McCoy’s Premier League in Glasgow on Thursday evening. Wade defeated Michael van Gerwen with another display of ruthless finishing to put himself on ten points alongside his Dutch opponent, Raymond van Barneveld and Phil Taylor in the play-off places. ‘The Machine’ took out finishes of 135, 134 and 130 to seal the win. “This game is all about finishing and that’s been my strength again,” said Wade, who takes on relegation-threatened Gary Anderson in Brighton next week. “Everyone knows the form that Michael has been in but mine has been picking up and nobody scares me. Thornton assured he would not be involved in the ‘Judgement Night’ relegation scrap as he produced an excellent display in defeating Simon Whitlock. ‘The Thorn’ moved onto nine points after averaging over 107 to delight his home crowd, while ‘Barney’ was beaten by Taylor. The night’s results mean Whitlock may have to get a result against van Gerwen if he is to avoid relegation in Brighton next week. Raymond van Barneveld will reignite his rivalry with world number one Phil Taylor in Glasgow, where James Wade and Michael and van Gerwen will meet on Thursday evening. ‘Barney’ will meet the ‘The Power’ for the first time since their high profile World Championship semi-final clash at Alexandra Palace. But the Dutchman, who is one of two players already safe from the threat of relegation, says the pair have left that affair in the past. “We’ll forget all about that game this week and I have to because it’s a big game. “In all these years in the Premier League I’ve never beaten him and only got one draw, so it would be a dream to beat him. 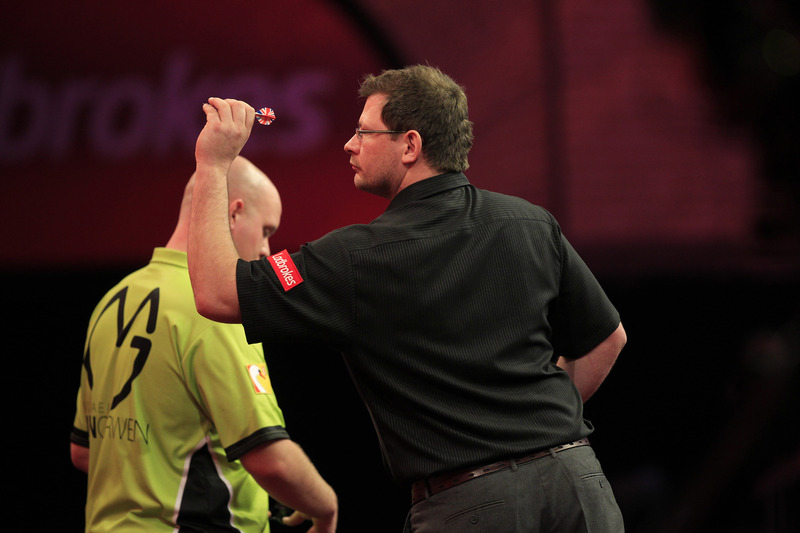 I know I can do it but I’ll have to lift my game from last week when I drew with James Wade. “This is a shorter format than the World Championship, the best of 12 legs, so I know I have to start well. I didn’t play my game in the first four or five sets the last time we played and I’m not sure why. “Perhaps it was because he is Phil Taylor, but I played so many great matches in the World Championship up to that point and against him I didn’t turn up. Wade will do battle with the other player who can’t be relegated in van Gerwen – in another repeat of the World Championship semi-finals. Simon Whitlock and Robert Thornton will both be looking to add to their points tally and move closer to safety when they go head to head, with ‘The Thorn’ enjoying home advantage. Gary Anderson meets Wes Newton while Adrian Lewis and Andy Hamilton do battle in the evening’s other matches. The ten Premier League players will then become eight when they head to Brighton for the final week of action before relegation in what is being billed as ‘Judgement Night’. It all started in Belfast back at the beginning of February when thousands of darts fans packed into the Odyssey Arena to see the best arrow flingers in the world showcase their talent. Now, three of the stars of the incredibly popular Premier League Darts are heading back to the city to treat fans to another night of superb sporting entertainment. Table-topping Dutch duo Michael van Gerwen and Raymond van Barneveld spearhead the brilliant line-up on show at the inaugural Belfast Masters, which takes place at The Devenish Entertainment and Leisure Complex next Friday (5 April), to take on some local hopefuls and fellow professionals. They will be joined by Simon Whitlock following the much-hyped ‘Judgement Night’ which will see hundreds of thousands of viewers tune in to see which two stars will suffer the fate of relegation from the Thursday night tournament. 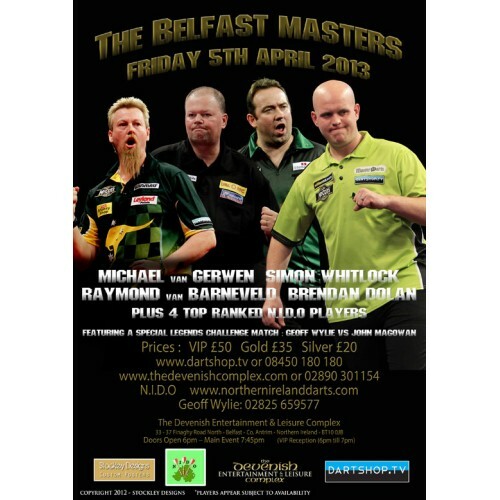 Over a thousand fans are set to flock to the Devenish to see their darting heroes in more intimate surroundings, with VIP ticket holders getting the exclusive chance to meet the players. Northern Ireland’s very own History Maker Brendan Dolan will also compete in the biggest darts show Belfast has ever seen aside from the Premier League itself. Four local men have earned the right to share the stage with the darting elite. Gary Elliot, Dave McCusker and two players with the same name, John Elder, will take on the professionals in the main event, an eight-man knockout tournament. The night will also see two challenge matches, including one between Northern Ireland Darts legends Geoff Wylie and John Magowan to warm up the crowd. 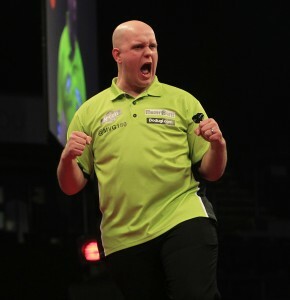 And van Gerwen, the leader of the Premier League, can’t wait to get back to Belfast. “I’m really looking forward to going back for this event with a chance to meet the fans,” said ‘Mighty Mike’. “I made me Premier League debut in Belfast and the crowd were really great to me so it will be great to be back. “It will be a night of great darts, which we will all want to win but we will have a lot of fun too. A range of ticket options are available and can be purchased directly from The Devenish (02890 301154) or via the event’s promoters MODUS Sports Management online at www.dartshop.tv or by calling the box office 08450 180 180. A limited number of tickets will be made available on the door on the night of the event. Darts will be back at the Devenish just a fortnight later when professional player Chris Mason takes to the stage for a charity night in support of Cedar Foundation on Saturday 20 April. 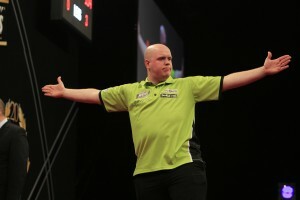 Michael van Gerwen charged to the top of the McCoy’s Premier League with a fantastic victory in Cardiff, where James Wade and Raymond van Barneveld shared a draw on Thursday evening. van Gerwen produced a sensational display to take a 7-1 triumph against Gary Anderson, with the Dutch ace hitting consecutive checkouts of 121, 120 and 164 along the way. The 23-year-old’s fourth win of the season, in which he averaged over 107, sent him to the summit of the table and clear of any relegation danger with ‘Judgement Night’ looming in two weeks. “My finishing at the beginning of the game was very good with those three ton-plus finishes but I was playing so well that I didn’t give Gary any chances. Wade produced fine finishes of 118 and 124 to share a draw with van Barneveld, who hit five 180s and is now second in the table. ‘The Machine’ remains inside the top four. 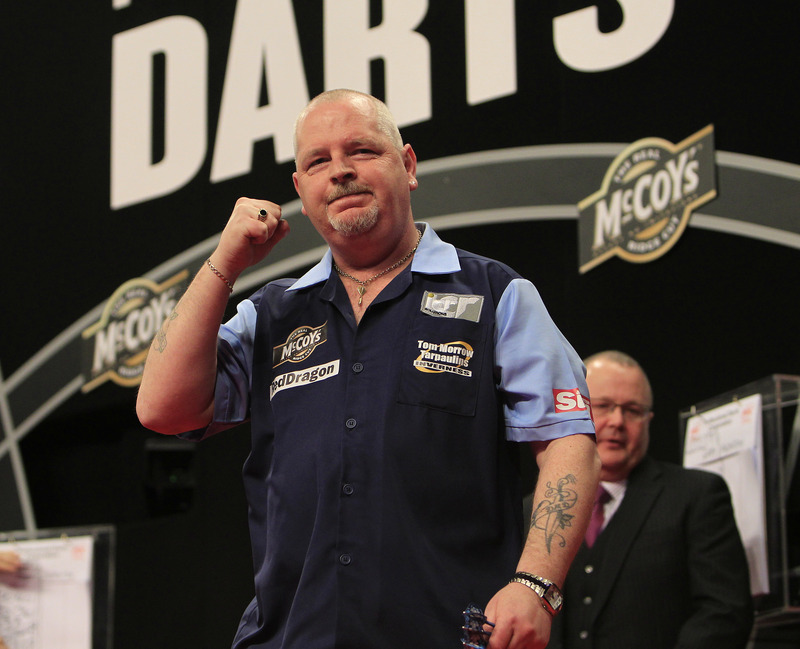 There was disappointment for Robert Thornton and Simon Whitlock, however, as they were edged out by Adrian Lewis and Andy Hamilton respectively. Phil Taylor defeated Wes Newton in the evening’s other match. 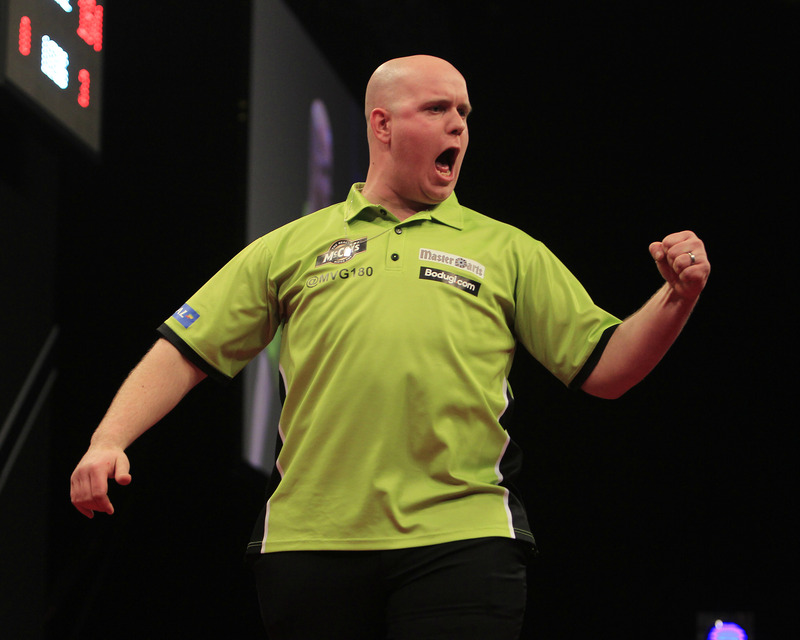 Michael van Gerwen and Robert Thornton both won UK Open qualifiers on a wonderful weekend for the Premier League pair in Wigan. van Gerwen added Saturday’s title to the two he had previously won last month, before Thornton stopped his rampant run on Sunday and took the honours himself. ‘Mighty Mike’ saw off Michael Smith in Saturday’s final to clinch the £6,000 first prize after he had narrowly missed double twelve to nail a nine-dart-finish in an earlier round. “I know I’m playing well and I’ve shown everyone again today. The Dutch sensation looked set to continue is incredible run of success on the Pro Tour, having won UK Open qualifiers 1, 2 & 3 in addition to the final Players Championship event in 2012, before he ran into the brilliant Thornton in Sunday’s semi-finals. Thornton, the reigning Speedy Services UK Open champion, claimed a 6-3 victory, before triumphing 6-4 against Jamie Caven in the final. “I’m chuffed to bits to get the win,” said Thornton, who will be appearing alongside van Gerwen in the Portsmouth International Masters in June. “It’s about time Michael let somebody else win! “In all seriousness though it’s so tough now. “The standard is incredible and it’s a proud day when you win one of these. Both players will turn their attentions to night seven of the McCoy’s Premier League in Cardiff, where they are in action on Thursday. There was also a strong showing from Paul Nicholson in both of the weekend’s events, with ‘The Asset’ reaching the quarter-finals on both days. Raymond van Barneveld and Robert Thornton shared a draw in Manchester on Thursday, while Michael van Gerwen and Simon Whitlock enjoyed victories on night six of the McCoy’s Premier League. ‘Barney’ stayed at the top of the table after taking a point from his 6-6 draw with ‘The Thorn’, who bounced back after suffering his first defeat in his debut season a week earlier. van Barneveld looked set to take victory in a game that included five consecutive breaks of throw but, with the Dutchman leading 6-4, Thornton hit fine finishes of 78 and 100 to share the spoils. 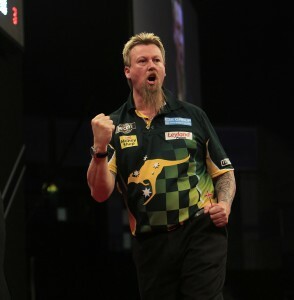 Fantastic finishing was the theme in a thrilling game between Whitlock and James Wade, which went the way of ‘The Wizard’ despite sensational checkouts of 170 and 144 from ‘The Machine’. Whitlock eventually triumphed 7-4 as both players hit three finishes over 100. And the Australian ace was delighted to come out on top in such a great game. “It was a brilliant match and an important win,” said the world number five. “I knew that I’d have to play great darts to beat James and it proved to be the case. “He produced some class finishes and I had to deal with that and take some decent shots out myself. van Gerwen produced another brilliant performance to see off Wes Newton with an average of over 100 as he put last weeks defeat to Adrian Lewis behind him. Lewis and Gary Anderson reached stalemate, while Phil Taylor was beaten by Andy Hamilton in the evening’s other match. James Wade and Simon Whitlock will do battle at Manchester’s MEN Arena on Thursday evening, when table-topper Raymond van Barneveld will meet Robert Thornton on night six of the McCoy’s Premier League Darts season. FOLLOWING the announcement of the Professional Darts Corporation’s new contract with Sky Sports, the PDC have now confirmed the latest prize fund increase as Players Championship events move to £50,000 per tournament. The success of the 2013 Ladbrokes World Darts Championship led to the PDC confirming in January that a review of all prize money would be undertaken, and that the first prize for the 2014 World Championship would increase to £250,000. Prize money for the McCoy’s Premier League Darts has increased to £520,000 this year, with prize funds for other major televised events currently under review. In addition, the PDC increased prize money for European Tour events in 2013 by almost £20,000 to £100,000 per event, with the series being expanded from five to eight events since last year. The PDC are now delighted to confirm that the 16 Players Championship events to be held in 2013 will now offer £50,000 each in prize money, an increase of £15,000 per event. The first prize in each Players Championship will increase from £6,000 to £10,000 as part of the move, as a total of £240,000 is added to the ProTour prize fund this year. “Earlier this year we committed to undertaking a review of prize money across all of our tournaments, and we’re delighted to be able to continue pushing prize money past £6 million annually,” said PDC Chairman Barry Hearn. “The news of our new, five-year Sky Sports contract is a great boost to the PDC and is also a recognition of the excellence shown by our players and the brilliant entertainment they are providing huge audiences around the world. “These players are now receiving greater rewards than ever in our sport and our increase in Players Championship prize money will be followed with further announcements as we continue with our aim to develop the professional circuit. Further to the PDC’s announcement that Sky Sports have extended their contract to broadcast six major tournaments through to 2018, the PDC wish to clarify that the 2013 Speedy Services UK Open will also be broadcast on Sky Sports HD. The PDC continue to hold discussions with other broadcasters in relation to our other major tournaments for broadcasts both in 2013 and beyond, with further announcements to follow in due course. James Wade, Simon Whitlock and Raymond van Barneveld all claimed excellent victories on night five of the McCoy’s Premier League. Wade produced a brilliant performance to see off Thornton with a 7-1 triumph, averaging over 105 and taking out two 121 finishes along the way. “I felt really good up there and it showed in my performance,” said ‘The Machine’, who upped his points tally to seven. “I keep saying it but the practise is really making all the difference and I feel that there’s more to come. Whitlock had to fight back from 4-1 down to take a 7-5 triumph against Wes Newton and was delighted to claim his second win of the season. He said: “That could be a very important win. “I have been playing well for the last few weeks but not getting the results so I’m thrilled to win tonight. van Barneveld went top of the table with his 7-5 success against Andy Hamilton, as six 180s and an average of over 100 gave the Dutchman his fourth win of the season. “Every opponent is tough in the league so I’m really delighted to have got four wins already,” said ‘Barney’ who faces Thornton next Thursday. “I’m a confident person now and maybe that’s what got me through in the last leg. I was relaxed and I believed in myself. Michael van Gerwen suffered defeat at the hands of a rejuvenated Adrian Lewis, while Gary Anderson beat Phil Taylor in the evening’s other matches. SKY SPORTS will take its partnership with the Professional Darts Corporation into a 25th year thanks to a new five-year broadcast deal. As part of the deal, Sky Sports viewers will also enjoy live coverage of the McCoy’s Premier League, PartyPoker.com World Grand Prix, William Hill Grand Slam of Darts, Betfair World Cup of Darts and the Betfair World Matchplay, which celebrates its 20th staging this summer. The partnership between Sky Sports and the PDC extends back to the organisation’s formation two decades ago, beginning with the 1994 World Championship. Since the PDC’s formation, live televised darts has grown from just a few hundred fans at venues such as the Circus Tavern and Salford’s Willows Variety Centre, to over 10,000 fans at the O2 Arena for the Premier League. The World Championship offers £1 million in prize money – over 15 times the prize fund for the PDC’s first World Championship back in 1994 – while over £5 million prize money is now paid out annually on the PDC circuit. PDC chairman Barry Hearn said: “We’ve just celebrated our 20th World Championship with the best tournament ever staged, and both that event and the current McCoy’s Premier League Darts show how far the sport has come in the past two decades. “Sky Sports has played an integral part in the growth of darts, with its innovative and high quality broadcasts and fundamental support of the PDC, and we are delighted to sign this new broadcast contract. This announcement continues a series of strong major rights deals for Sky Sports over the twelve months, including: Barclays Premier League, England & Wales cricket, British & Irish Lions, Heineken Cup, European Tour, Ryder Cup, NBA, NFL, plus many more. ive darts coverage is also available via Sky Go, which offers Sky customers access to live and on demand programmes and films from up to 43 channels on a wide range of internet-connected devices including laptops, smartphones, tablets and games consoles. Watch the McCoy’s Premier League Darts live on Sky Sports, with the current season running through until the Play-Offs on Thursday May 16. See tonight’s Week Five action live from 7pm on Sky Sports HD2 from the Capital FM Arena in Nottingham.